We ate “Flasbankaka” for dinner tonight. I guess it is swedish for “oven pancake”. Whats really funny is that since the stovetop is broken, we had to brown the sausage on the grill. Well, I happily drank coffee with it since Seth and I were planning on watching the new Jim Gaffigan disc once the kids went to bed. But…He fell asleep on lucy’s floor. So I slipped out of bed – not quite tired enough to turn my brain off for the night. I realized it was time to write. 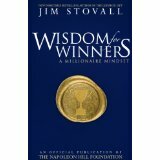 In his book “Wisdom for Winners” Jim Stovall captures the wisdom of the sages throughout history and adapts them for a generation with a 21st Century mindset. Stovall integrates ethics, attitude, faith, and perspective as keys to achievement and success in today’s competitive work environment. The book is a compilation of Stovall’s previously published columns. They are organized in four categories: Wisdom for the Spirit, Community Focus and Winning Relationships, Focus on Business and Finance, and Success in Action. I began my adventure in reading “Wisdom for Winners” by scanning the topical titles and headings. I was soon drawn into examining the quotes, bold print concepts, and short itemized listings of ideas and principles. Before long I found myself poring over the pages realizing the material is worthy of reflection, contemplation, and commitment to action. I was especially challenged to focus on my goals and objectives, to pursue my passion and maximize my talent, to maintain a higher level of professionalism, to keep on course by maintaining my faith, and to “dedicate myself to making each day and investment” in my future. Stovall’s writing sets a new standard for inspirational and motivational writing to take on a deeper dimension of positive life change and redirected goals in the quest for fulfilling a sense of personal destiny. Highly recommended. The shame and humiliation that follows the widely publicized court case and resultant imprisonment of her father for the euthanasia of her terminally ill mother left Jayne Dennegee devastated. In an effort to escape the mounting pressure and trauma of community bias and unfounded judgment Jayne took on a new identity, as Becca Morrow. She legally changed her name and accepted a position as nurse and companion to an incurable elderly woman in California, two thousand miles from her home in Iowa. 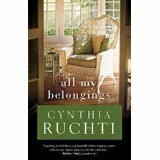 Cynthia Ruchti skillfully challenges the reader to come to grips with the reality of the dilemma faced by caregivers dealing with loved ones suffering with a terminal illness or incapacitated by dementia. Ruchti has a lyrical writing style that is compelling, using a combination of the elements of good story telling, building a plot providing an ample balance of suspense, humor, and heartwarming pathos. Her characters are strong, well developed, and believable. She used the medium of the novel to bring a message of the results of the poison of prejudice, the entrapment of deception, the reward of revealing truth, and the healing of forgiveness. “All My Belongings” will resonate with readers in the midst of the role and trauma of providing long term care to a loved one. A timely must read for counselors, pastors, hospice workers, and extended care facilitators.